Initially built as a boiler house and later serving as car repair shop, the Plechárna was converted in 2013 into a Prague 14 community centre with a broad range of activities, a café and a leisure-time facility. At that time, the mayor of Prague 14, Radek Vondra, and the director of the Prague 14 cultural contributory organisation, David Kašpar, got together and dreamt up a new destiny for the Plechárna. The basic idea was to create a place for meeting and for spending one’s free time. Local residents were to be involved in the planning from the beginning. The Prague 14 city district entrusted the Plechárna to the contributory organisation and in spring 2013 residents met for the first time in order to take part in the discussion of the direction that the Plechárna should take and how it should look. Workshops for local children and local youths were also conducted. The young generation had to be kept in mind during the construction of the Plechárna. Due to the fact that the building neighbours a skate park, it would have to be expanded with a covered sports field in the leisure-time facility. The Plechárna grew with the people who began coming to it. The Plechárna opened to the public for the first time in September 2013. At that time, it was an industrial building that had undergone only rough renovation and its use had yet to be determined. 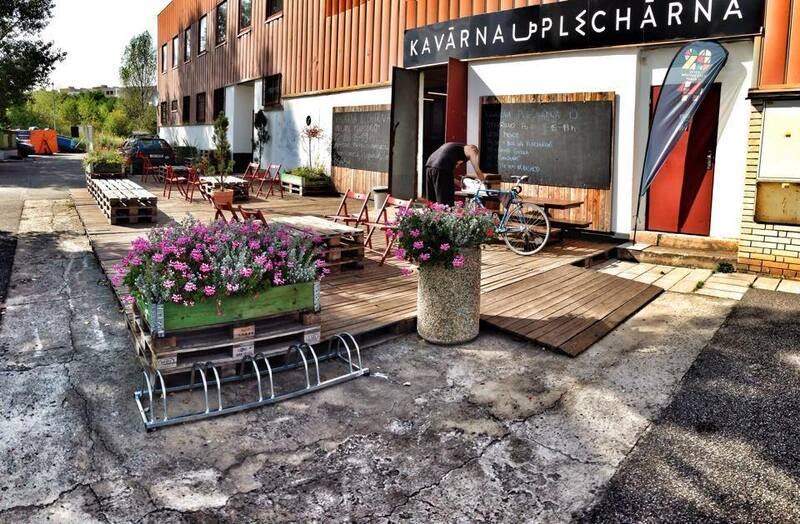 However, it was not the impatience of the implementers that opened the Plechárna’s doors. It was the next step in expanding the cooperation with the local people in order to create a made-to-order community centre that people would like to visit. From the beginning, the plan called for a covered skate park, regular sports courses and one-off events. In 2013, the centre featured boxing in the large hall, a concert of the Czech Philharmonic Children’s Choir was held, melodies emanated from the music rehearsal rooms and conversations were held in English in the club room. After the first year in operation, and to the joy of everyone who spent time among frozen tin cans in the winter, the city district undertook an important step and insulated the Plechárna. Air conditioning was installed during that same year. Renovation of the Plechárna’s interior spaces followed in 2015. The interiors were changed. In particular, music rehearsal rooms were removed and a studio, small hall and shared office space were added. New dressing rooms with showers were opened and the café was also improved. In 2016, the Plechárna again welcomed the residents of Prague 14. Part of the regular programme was renewed and only the grand finale remained, which was completion of the floors in the halls. Even without the skateboarding hall, the Plechárna came alive. The Černý mošt neighbourhood celebration was held for the third time and people could sample cuisine from around the world for the first time at the Setkání chutí food festival. The first cup of coffee was again brewed in the Plechárna training café under the direction of the non-profit organisation Neposeda. In only three years, the Plechárna was converted into a centre that intends to enliven Prague 14 and to give local residents a reason to stay and to come here with friends and a place to send their children for sports and artistic activities and, mainly, to get together.